The promise of becoming more by doing less sounds incredible almost too good to be true but people intuitively know it is possible when they get "engaged." 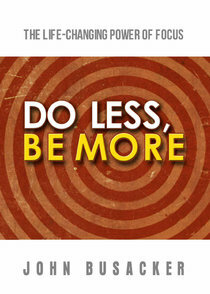 About "Do Less, Be More"
John Busacker is President of The Inventure Group, a global leadership-consulting firm, and Founder of Life-Worth, LLC, a life planning creative resource. He is a member of the Duke Corporate Education Global Learning Resource Network and is on the faculty of the University of Minnesota Carlson School's Executive Develop Center. His travels have taken him to six continents as a sought-after speaker on self-leadership and personal engagement with a who's who of global organizations.